Harley Davidson Book Ends. 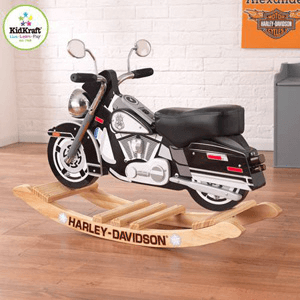 Each Book End Has A Wooden Motorcycle Positioned On A Grey Road With An Orange And Black Harley-Davidson Bar And Shield Logo Positioned Behind. Perfect For Shelves, Desks Or Bookcases.Dimensions: 7.75 In. x 5 In. x 6.37 In. Medium Locker. This Locker Is Perfect To Keep Your Kids Organized. Our New Lockers Are Fun &#8220; Yet Functional ˜ The Perfect Way To Keep Kids Rooms Tidy. With 2 Separate Storage Compartments, These Fun, Retro-Styled Lockers Are Available In Red, Royal Blue, And White. Size: 13.75 In. x 14 In. x 28.5 In. (H)Weight: 27 LBS. The Modern Todder Cot Has a Simple, Modern Look and Helps Make the Transition from a Crib to a Regular Bed as Painless as Possible for the Young Ones in Your Life.FeaturesBench at the Foot of Cot Can be Used for Additional Seating or Storage.Decorative Bed Rails Keep Kids SecureLow to the Ground Allowing Easy Access for KidsComes in Nuetral, Natural Finish.Fits Most Crib Mattresses.Made of Wood. Sturdy Construction.Easy Assembly.Dimensions: 63.5 In. x 31 In. 18.25 In. (H)Wt:60 LbsBedding and Mattresses Not Included with Toddler Cots. It is time to go out and keep the highways safe.